The Oregon Department of Fish & Wildlife will apply for a new permit to kill California sea lions. Oregon's native salmon have a new friend in the White House. President Donald Trump has OK'd legislation giving wildlife overseers a freer hand to euthanize sea lions feasting on threatened fish in the Columbia River and its tributaries, such as the Willamette River. The Endangered Salmon Predation Prevention Act signed into law Dec. 18 has elicited howls of protest from environmentalists who want to preserve animal life — while Oregon's D.C. delegation hailed it as a rare red-and-blue achievement. "Salmon are critical to Oregon's economy, culture and heritage," said Sen. Jeff Merkley, "and it's clear that sea lions are creating a serious threat to the very survival of endangered salmon." Sen. Ron Wyden added: "This bipartisan compromise shows that Congress can still function, in a bipartisan way." Culling California sea lions is nothing new for the Oregon Department of Fish & Wildlife. The agency returned to lethal removal in March after realizing that capturing the pinnipeds at Willamette Falls and then trucking them to the coast had little effect. Why? The sea lions swam right back. 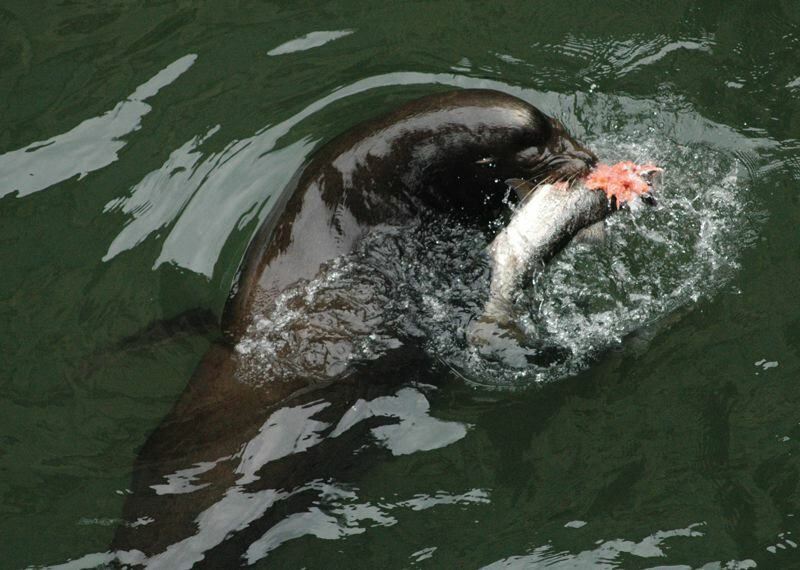 The National Marine Fisheries Service gave ODFW the stamp of approval in November to kill any sea lion that was spotted chomping on fish or lingering near Willamette Falls. Officials say three sea lions were euthanized in the first three weeks after approval was recieved. But the new rules, which require a not-yet-granted permit from the U.S. Secretary of Commerce, allow ODFW to kill any sea lion that sets flipper into the Columbia or its tributaries. The sea lions "are only there for one purpose," said Shaun Clements, an ODFW policy analyst, noting that the law doesn't increase the total number of sea lions that can be killed. He said the agency will apply for a permit in 2019 and could hear back in another six months or so. "By being proactive, you don't let 100 sea lions congregate in an area. Ultimately, this should let us remove fewer sea lions," Clements said. The law is designed to protect the runs of winter steelhead and spring Chinook, but Clements said it could be applied to other species too. The Animal Welfare Institute, however, calculates that 55 percent of the Chinook's spawning habitat is blocked by dams, and says the new law won't help fish in the long term. "The salmon will not recover and these sea lions will die for nothing," said Naomi Rose, a marine mammal scientist working for the institute.